The Northeast Conference matched last year’s all-time high of All-America selections from the Sports Network. Bryant DE Jeff Covitz, a Second Team selection, ranked amongst the FCS top-5 leaders in TFL and ended his career as the all-time #NECFB sacks king. Sacred Heart S Gordon Hill, a Second Team selection, logged 14.5 TFL and 2 INT during his senior season. Saint Francis RB Khairi Dickson, a Third Team selection, led the FCS in rushing yards for the regular season. Duquesne WR Chris King, a Third Team selection, caught 14 TD passes. Sacred Heart OL Jaime Martinez, a Third Team selection, started every game at RT during SHU’s two championship seasons. Wagner LS Phil Faccone, a Second Team selection, is the lone repeat All-American of the group. Wagner DB Jarrett Dieudonne, a Third Team selection, made 7 INT in 2014 and returned 3 picks for TDs. Duquesne KR Devin Rahming, a Second Team selection, was the lone NEC player to return both a kickoff and punt for TDs this season. They both anchored top-10 defenses and they can both call themselves 2014 Associated Press Division I FCS All-Americans. Wagner cornerback Jarrett Dieudonne (Second Team) and Bryant defensive end Jeff Covitz (Third Team) represented the Northeast Conference when the AP unveiled its three All-America Teams on December 17. Bryant’s Jeff Covitz is a three-time All-NEC First Teamer and the conference’s all-time sacks leader. Dieudonne’s journey to All-America status started at Purdue where the Floridian spent a season on the scout team before resurfacing on Staten Island. In his first season after transferring to Wagner, Dieudonne earned all-NEC first team honors while helping the Seahawks to the 2012 NEC crown and a FCS playoff appearance. Dieudonne returned to the All-NEC First Team in 2014 as the captain of a defense that finished the regular season ranked tenth amongst national leaders in point allowed per game (18.0) and sixth in yards allowed per game (281.6). He made a league-high seven interceptions in 2014, becoming only one of nine players in NEC history to reach that mark, and his 14 career picks are tied for sixth all-time in conference annals. Dieudonne ran three of those seven interceptions back for touchdowns, amassing a FCS-best 245 INT return yards. With 10 pass break-ups to his credit, he led the NEC in passes defended (17). The 6-foot-1 Floridian, who was also strong against the run, totaled 33 tackles, including 3.0 hits for a loss. Covitz, the NEC Defensive Player of the Year, was a key component of the most-fruitful season in Bryant’s Division I history. The 6-foot-2 defensive end captained a team that posted a program-record eight wins and cracked the Division I FCS Top 25 rankings for the first time. The Bulldogs owned the nation’s fifth-ranked scoring defense (16.1) and ninth-best total defense (299.9 ypg). In addition to the team accomplishments, there are plenty of individual achievements that made the 2014 season a memorable one for Covitz. The Massachusetts product became the NEC’s all-time sacks leader in a win over Robert Morris and finished his career with 29.5 quarterback takedowns. His 23.0 tackles for loss paced the Northeast Conference while the 2.1 hits for loss per game average stands as the second-best in the FCS. The Sports Network, the leader in FCS coverage, will announce its All-America selections on Tuesday, December 23. We’ll have the results here on Overtime! Blog. Four Northeast Conference players found themselves listed amongst the best in New England for the 2014 season. 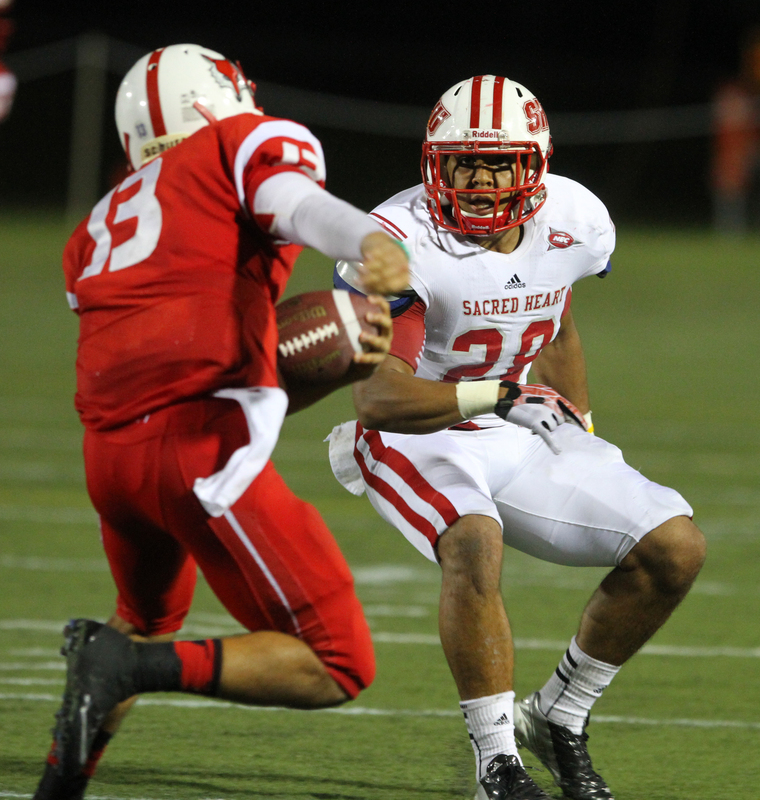 SHU safety Gordon Hill totaled 26 tackles during the Pioneers’ two wins over top-25 teams. The New England Football Writers Association recently unveiled its regional all-star team, which included Bryant’s Jeff Covitz, Sacred Heart’s Troy Moore, Central Connecticut’s Rob Hollomon and Sacred Heart’s Gordon Hill. Covitz has become a staple on the All-New England Team in recent years. The 2014 NEC Defensive Player of the Year earned his third consecutive selection to the all-star team. The 6-foot-2 defensive end wrapped up his career with an NEC-record 29.5 sacks and a program-record 66.0 tackles for a loss. Covitz, who played in 45 career games, became the first player in Bryant history to be named to the Buck Buchanan Award Watch List. Hill made his first appearance on the All-New England Team following a sensational senior season. The SHU safety made a team-high 104 tackles and was a key component on a defense that ranked amongst the nation’s top-10 leaders in both yards and points allowed. In 12 games, he logged 14.5 tackles for a loss (a league-high mark amongst NEC DBs), 6.0 sacks and two interceptions. He was the team’s top tackler in each of its three contests against top-25 opponents. Moore, the 2013 NEC Defensive Player of the Year, played at the front end of SHU’s nationally-ranked defense. The senior tackle consistently drew double, and sometimes triple, teams from opponents and finished the season with 64 stops. Hollomon earned on of the three running back slots on the All-New England Team after completing a stellar career at CCSU. The Philadelphia product became the first Blue Devils ever to reach the 1,000-yard rushing mark in three consecutive seasons. He ran for 1,116 yards on 228 attempts in 2014 and accumulated 1,828 all-purpose yards while playing in 11 games. During the season he became CCSU’s all-time leader in career rushing yards and finished with a career total of 3,672 yards. 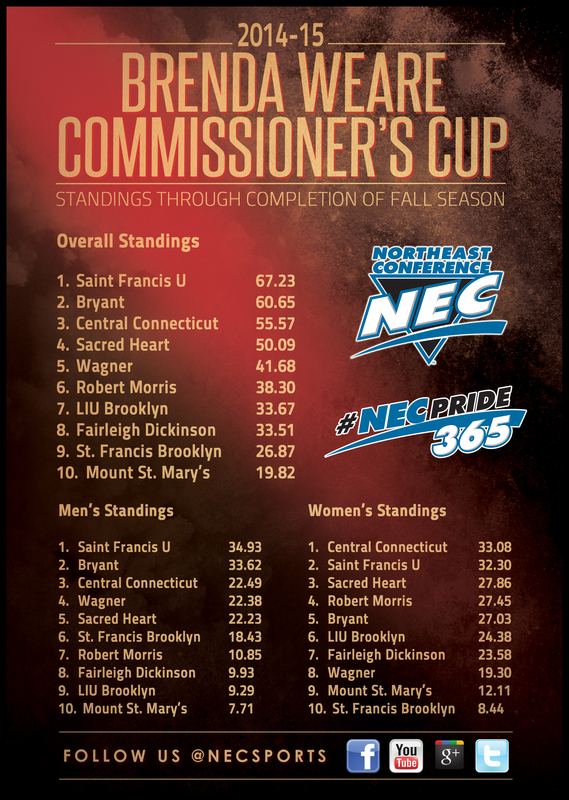 There’s still a long way to the finish line, but Bryant and Saint Francis U are once again in a battle for the coveted Brenda Weare Commissioner’s Cup.